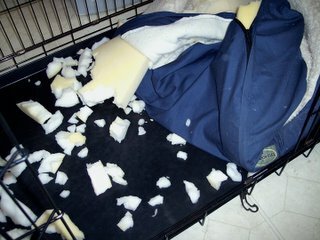 Dogs, Cats and Other Phenomena: The Monster That Ate Her Bed! The Monster That Ate Her Bed! You see this bed? This bed was new. This bed was just bought last week. It became Dog Fodder today. Everything was going so well. Nikki had chosen the bed herself at PetsMart. It was warm, cozy. Just perfect on these chilly fall nights. Nikki played with the bed when I had it on the den floor, so I put it in her crate instead. Took out those uncomfortable sheets and towels that had been her bedding. Did she appreciate this kind and loving gesture on my part? No, I fear not. It all started about noon. Nikki had been taking a nap but began to cry to go outside. When I walked into the kitchen, my heart stood still. Very briefly. There was Nikki, looking up at me with those big brown eyes. Surrounded by little pieces of Styrofoam that were everywhere. Just everywhere. Somehow, this ingenious pup had managed to unzip the bed and then tear at the Styrofoam inside. She ripped about half of the bed. I let Nikki out. She drank water ... any thoughts on why she was thirsty? I cleaned up the mess. Zipped up the bed and put it into the den. Tonight, Nikki began tackling the bed. I think she'd make a good football player. hehe...that little rascal! Tia, she is a bored and mischievous pup! Maybe she needs a boyfriend to keep her company ;) ...wouldn't you just love another puppy just as rambunctious! Callie, House, English Comedies, Ugh. Intermediate Training for Miz Pup, Etc.